STEUBEN COUNTY – The Indiana Department of Transportation announces a tentative timeline for a contract on I-69 through Steuben County. Work on the project, which includes 15 miles of asphalt resurface on I-69 as well as several bridge projects, is scheduled to begin or after Saturday, April 6, weather permitting. On or after Saturday, April 6, weather permitting, motorists can expect lane restrictions on I-69 between mile markers 334 to 350 in Steuben County to allow INDOT contractors to begin the asphalt resurface work. Also during the month of April, contractors plan to begin the bridge deck overlay on I-69 over the Norfolk Southern Railroad track in DeKalb County, .55 miles south of U.S. 6. 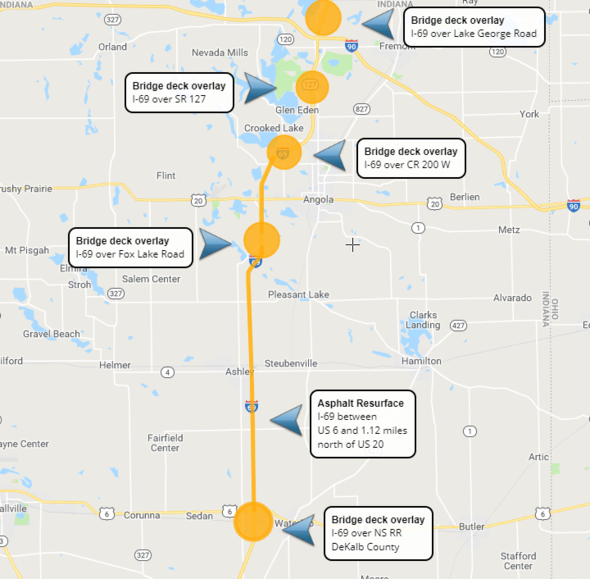 In late April, contractors will begin work on the bridge deck overlay on I-69 over West Fox Lake Road, 1.80 miles south of U.S. 20. Work on the resurface and two bridges south of U.S. 20 are expected to be completed by late August, weather permitting. Later this spring, contractors will begin work on the C.R. 200 W bridge and the S.R. 127 bridge. In the fall, following the resurface work, contractors will begin work on the Lake George Road bridge. Work on all bridges is expected to be completed by late October, weather permitting. INDOT reminds drivers to use caution when traveling through any active construction zone. A reduced speed limit will be in effect and strictly enforced. The project is scheduled to be completed in late 2019, weather permitting. The contract was awarded to INDOT contractor Brooks Construction Company for $9.8 million. View this project in INDOT’s online travel system at INDOT.carsprogram.org. Drivers in Northeast Indiana can monitor road closures, road conditions, and traffic alerts at any time via the District’s social media channels: www.Facebook.com/INDOTNortheast or Twitter @INDOTNortheast. Or visit http://www.trafficwise.in.gov for INDOT’s TrafficWise Traveler Information Service. INDOT empowers businesses to deliver Indiana to the world and bring the world to Indiana by providing a transportation network that is second to none. The agency builds and maintains more than 28,000 lane miles of highway and 5,600 bridges, and provides oversight for 117 public aviation facilities and more than 4,000 miles of active rail lines. Indiana ranked as the #1 state in the U.S. for infrastructure in CNBC’s 2016 “Top States for Business” ranking.Learn more about INDOT at in.gov/indot.